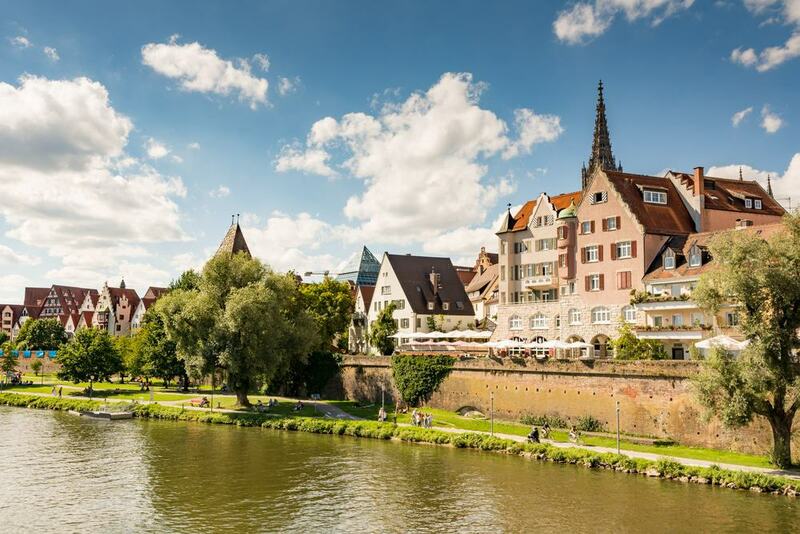 On the Danube in Baden-Württemberg, Ulm will forever be synonymous with its epic minster. The city, also the birthplace of Albert Einstein, is a heady juxtaposition of Medieval and modern: Dating back hundreds of years are the city’s walls by the Danube and the quarter where fishermen and tanners used to live. The half-timbered houses and traditional German restaurants on these streets clash with avant-garde new monuments to replace architecture lost in the war. And back to that minster, which soars over everything else in the city. Until the 1900s this church was in the top five tallest buildings in the world and has enough room for 20,000 worshippers. To set the scene, Ulm Minster has the highest steeple in the world, is officially the tallest complete church in the world and coming into the 20th century it was the 5th tallest man-made structure. From the tower, 768 steps and 143 metres up, there’s a panorama of the Alps far in the distance to the south. 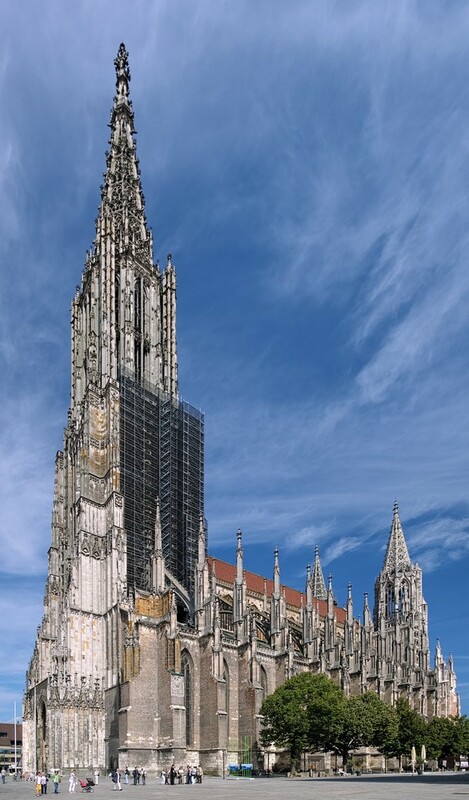 Ulm Minster was started in 1377, but partly because of its extreme dimensions was only officially completed in 1890. In the western portal take a moment to study the tympanum, filled with 14th-century carvings of scenes from the book of Genesis. Down in the central column of the entrance is the Man of Sorrows by the Late Gothic sculptor Hans Multscher. Don’t leave without seeing the 15th-century carved oak choir stalls, the apse’s stained glass windows from the same period and the 17th-century organ played by Mozart in 1763. Where the channels of the Blau Stream enter the Danube is the Medieval waterside quarter for Ulm’s tanners, fishermen and shipbuilders. The neighbourhood reached its zenith in the 1500s when trade on the Danube was roaring. As a testament to this high demand, the streets are tightly packed with cantilevered timber-framed houses, some so close to each other that they sometimes touch in front, like on the appropriately named Kussgasse (Kiss Alley). The quarter was also a kind of staging post for emigrants travelling down the Danube to Hungary. They’d normally stay here for a few months to raise money before making the journey. As you’d expect the quarter has a lot of tales to tell, and its old wooden houses are now specialty shops, bars and restaurants. What could be the cutest building in Ulm is the Schiefes Haus, a rickety inn from the start of the 15th century. 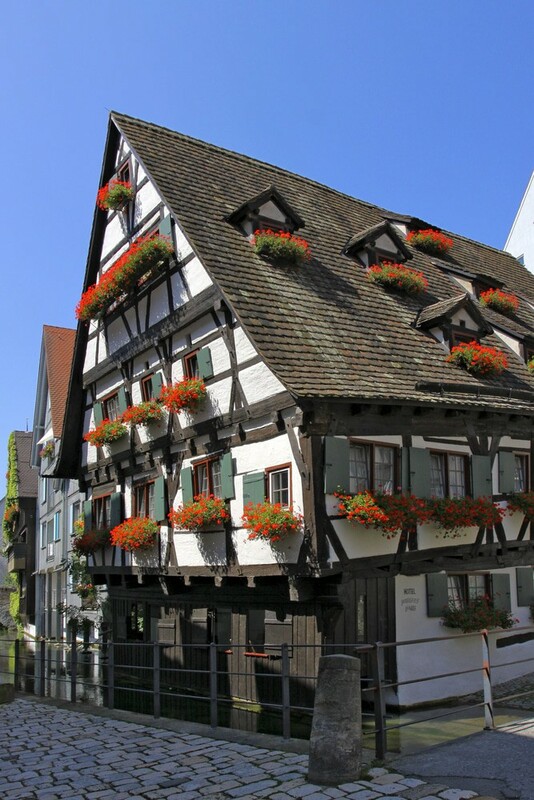 This corbelled, half-timbered house was used by Ulm’s shipmasters for hundreds of years. At an incline of between 9 and 10° the Schiefes Haus looks like it’s just about to collapse, but is still going strong 600 years after it was built. Adjustments have had to made over time, especially after the side facing the river started sinking in the 1600s. According to the Guinness Book or Records it’s the most crooked hotel in the world (literally, not figuratively!). If you’d like to book a room you can rest easy knowing that your bed will at least be flat; the furniture adapts to the slope, which can be as much 40 cm in each room. The museum for bread culture has an apt home in a Renaissance granary that was built in 1592 and was in use until the start of the 19th century. 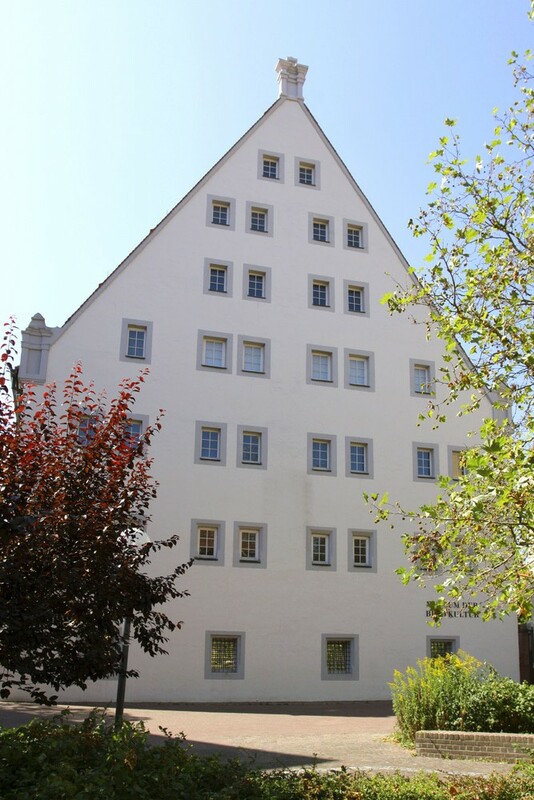 In 1955 the father and son Willy and Hermann Wiselen converted the warehouse into a museum about bread and its role in civilisation from prehistory to today. You’ll delve into grain cultivation, milling, bread-making methods in different parts of the world and Medieval bakers’ guilds in Europe. The museum has more than 18,000 objects, from ancient Europe to rice cultures in East Asia and maize cultures in Latin America. Something that might catch you off guard is the richness of the art collection that has bread-themed works by Pieter Brueghel the Younger, Rembrandt, Max Beckmann and Picasso. Some way south of Ulm, near the confluence of the Iller and Danube Rivers, is a former Benedictine Abbey, now a department of the University of Ulm. The abbey was founded in the 11th century, and in the 18th century went through a period of rejuvenation, when its buildings were redesigned in an exuberant Late Baroque style. The biggest achievement in that period was the Rococo library on the north wing of the complex, which is spellbinding for its marble columns with gilded capitals, figurative ceiling fresco, balustrade, virtuoso stuccowork and sculptures by Dominikus Hermenegild. Coated with trompe-l’œil frescoes, Ulm’s majestic old town hall has an Early Renaissance design and is composed of three buildings, the oldest of which dates back to the 1370. The oldest architecture is on the southeast side of the complex, while the gables and daintily ornamented windows are from the 15th century. 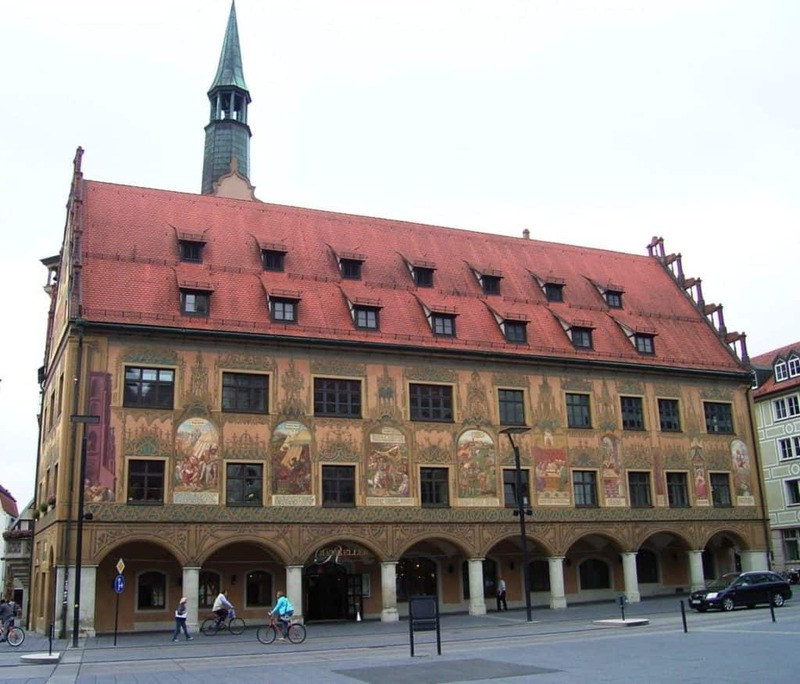 The town hall has always been covered in murals, but by 1900 these were heavily weathered and were completely restored along the lines of the originals, depicting moment’s from Ulm’s past. Spend a little time inspecting the astronomical clock, dating to 1520 and fitted with a mechanism by the Strasbourg master watchmaker Isaak Habrecht in 1580. If you’re up for a restorative stroll you could make for the Danube bordered by a long remnant of Ulm’s defensive walls. Built from brick, these date to 1482 and run from the planted Lauseck Bastion in the west for the length of the old town to the spacious Friedrichsau Park in the east. There’s a continuous raised looking over the Danube, Ulm’s docks, the fishing quarter and the old town’s cobblestone streets. One of the most picturesque spots is just east of the Herdbrücke, where the florid Rosengarten has lawns fringed by dozens of labelled rosebushes. 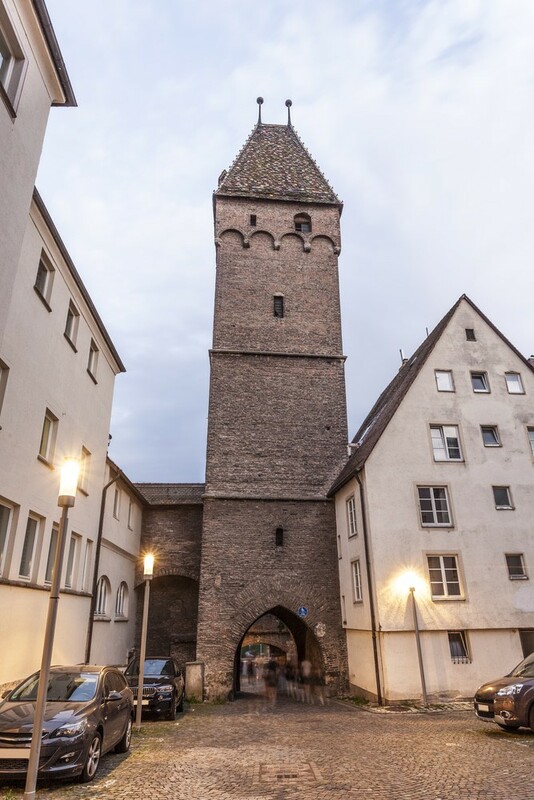 One unforgettable element in the defensive system by the Danube is the Metzgerturm (Butchers’ Tower), a gate predating the current line, going back to 1340. The tower got its name as an opening had to be made in the wall to make it easier to reach the city’s slaughterhouse, which was built outside the walls. On a square plant, this structure is 36 metres tall and has a hipped roof. But you may notice that is isn’t entirely straight. Due to the marshy ground the tower leans two metres to the northwest; at 3.3° the slant is only slightly less severe than the Leaning Tower of Pisa (3.97°). In four adjacent houses on Ulm’s Marktplatz, the municipal museum is unmissable for its Gothic and Renaissance sculpture, but also a prehistoric statue that has no equivalent in the world. The Lion-man was discovered in the Hohlenstein-Stadel cave in 1939 and was shaped with a flint knife from mammoth ivory between 35,000 and 40,000 years ago. At 30 centimetres tall this is the oldest example of figurative art in the world, comprising the body of a man with the head of a lion. For art of a more recent kind there are paintings and mesmerising works sculptures by members of the Late Gothic Ulm School, like Michel Erhart, Nicklaus Weckmann, Hans Multscher, Martin Schaffner and Jörg Stocker. And lastly, there’s a neat collection of Expressionist works by Kirchner, Macke, Paul Klee and Franz Mac. While a lot of historic buildings remain in the Fisherman’s Quarter other parts of the old centre were badly affected by bombing in 1944. Here, bold new amenities have been constructed over the last 25 years or so. Take the Central Library, opposite the Old Town Hall and Minster, designed by Gottfried Böhm and in the shape of a glass pyramid. The new synagogue was unveiled in 2012 close to where the original used to stand before 1938, with guided tours provided by the church office. Two more contemporary projects, the Kunsthalle Weishaupt and the Stadthaus follow below. That wave of architecture has given Ulm a private contemporary art museum. The Kunsthalle Weishaupt opened in 2007 in a cube-shaped building designed by Wolfram Wöhr. 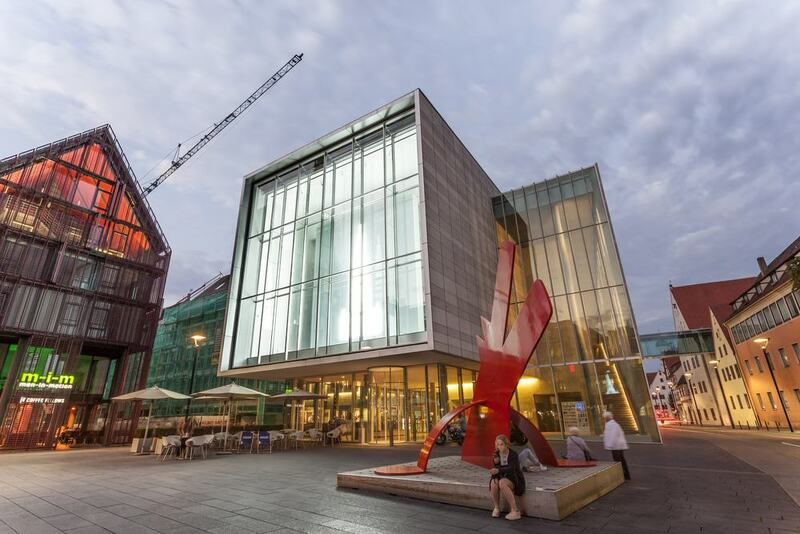 The museum is named after the entrepreneur and art patron Siegfrid Weishaupt, who has built up a notable assortment of art by the ZERO group, Lichtenstein, Warhol, Nam June Paik, Josef Albers, Yves Klein, Willem de Kooning and Keith Haring among many more. This is shown to the public in themed exhibitions like the 10-year anniversary exhibition “Best of 10 Years”, which has highlights from the last decade (Haring, Robert Longo, Yves Klein and Max Bill) and will run until April 2018. Under the Minster’s sky-scraping spire is another modern addition to Ulm’s cityscape. 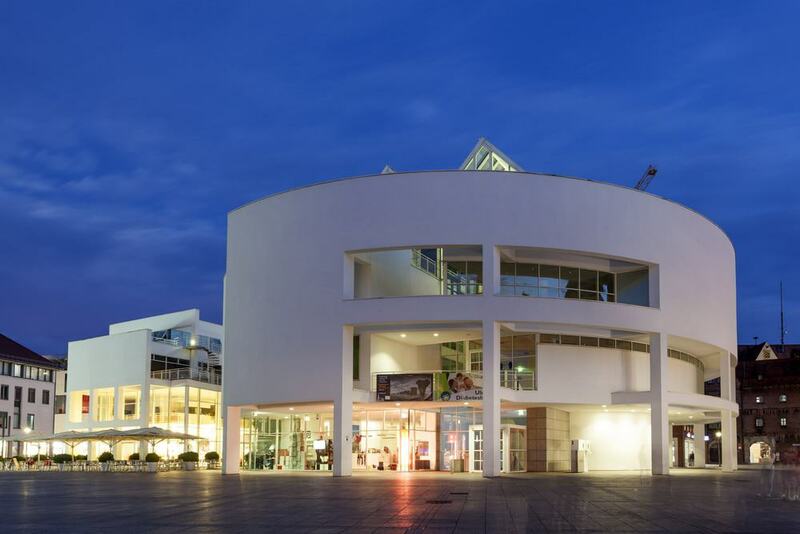 The gleaming white Stadthaus by New York architect Richard Meier is an attention-grabbing landmark that opened in 1993. The cavernous space inside hosts conferences, lectures, concerts and exhibitions for almost anything, from art to science. 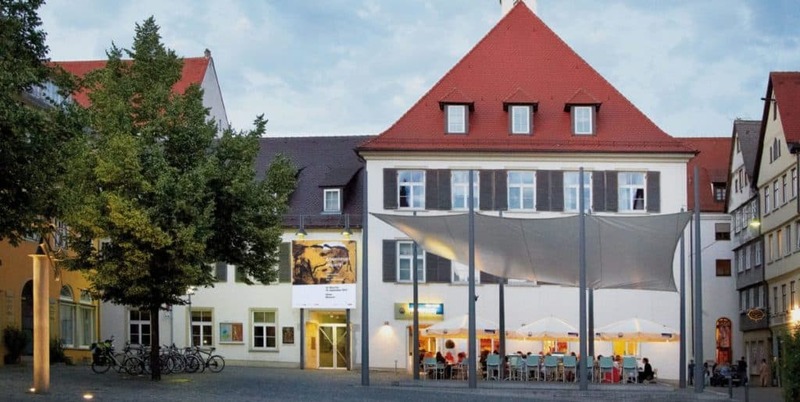 The Stadthaus is also where you’ll find Ulm’s tourist office, as well as a restaurant that opens for breakfast. Given the location there’s no harm stepping inside to see what’s on, and to take in the building’s daring architecture. Ulm’s zoo might be on the small side, but has a variety of regional and exotic animals for kids to get close to. Best of all is the Danube aquarium, which has a glass tunnel surrounding you with the freshwater species that make their habitat in the famous river. Also inside are terrariums for iguanas, turtles, poison dart frogs, chameleons and giant African snails. Outside, the park’s brown bears have been a fixture at the zoo for decades and have an enormous enclosure, while there are also emus and ostriches, massive Vietnamese pot-bellied pigs and a habitat for goats that kids can walk inside. At a spacious 28 hectares, Ulm University’s botanical garden is one of the largest in the country. 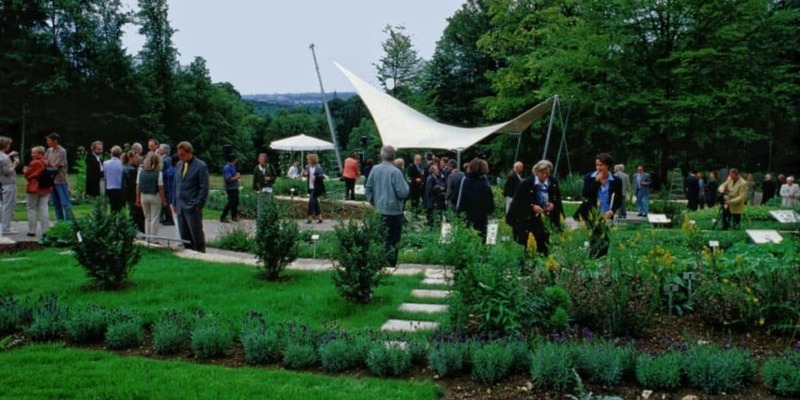 The gardens are a tapestry of plant beds, meadows and forest, all laid out in 1981 on what used to a shooting range on the Obere Eselber hill to the southeast of the university. Closer to the uni are the greenhouses for rainforest species, cactuses and Mediterranean plants. And on trails you’ll come across a farmer’s garden with traditional crops, a herb garden, a rose garden, an arboretum, a cottage garden, an orchard and farmland where crops are rotated annually. Ulm’s annual city holiday falls on the penultimate Monday of July. The day has an administrative purpose, as it is the beginning and end of the political year in Ulm, and marks the swearing-in ceremony for the new lord mayor (“schwören” means “to swear”) . But there’s more going on than dry political procedures. In the afternoon there’s a big bathing party in the Danube, known as the “Nabada”. Starting at 16:00 the Nabada is like a carnival on the water, with a flotilla of official themed boats and crazy home-made barges. If Nabada falls on a warm day it will feel like the whole city (60,000 or more) has taken to the water on tubes, rafts of rowboats.